Former Manchester United manager Sir Alex Ferguson has said his tough approach with players may have cost the club silverware during his time there. Roy Keane, Jaap Stam, David Beckham and Ruud van Nistelrooy were among the high-profile players who fell out with Ferguson during his 26 years in charge. The Scot won 38 trophies, including 13 league titles, two Champions Leagues, five FA Cups and four League Cups. The 73-year-old said: "I place discipline above all else." Writing in his new book Leading, Ferguson added: "It might have cost us several titles. If I had to repeat things I'd do it precisely the same." The most high-profile fall-out came when Ferguson kicked a boot at former England midfielder Beckham during a dressing-room bust-up after an FA Cup defeat by Arsenal in 2003. 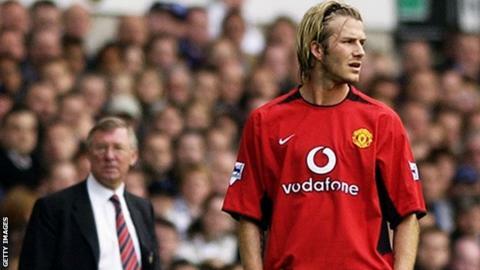 It left Beckham, 40, with an injury above his left eye and the former LA Galaxy player left for Real Madrid later that year. United went three years before winning the Premier League title again after his departure. Former Republic of Ireland international midfielder Keane, 44, left Old Trafford in September 2005 after criticising team-mates in an interview for MUTV as Chelsea won the title that season. Centre-back Stam, 43, was sold to Lazio in August 2001 after writing in his autobiography that Ferguson "tapped him up" while the former Netherlands international was still at PSV Eindhoven. Ferguson said his decision to sell Stam was based purely on footballing matters. Van Nistelrooy and Ferguson fell out after the 39-year-old former Netherlands striker was on the bench for the Carling Cup final in 2006. A successful period for United followed, winning three consecutive league titles and the Champions League in 2008.